An alternate vote or ranked ballot system allows you to choose which candidates you prefer, rather than just one candidate. Your ballot has all of the candidates in your riding, and then you rank them, 1, 2, 3, etc. You can stop as soon as you run out of candidates you like, so some people will have only 1 choice, and others will have more. When the votes are counted, the winner is the one who has more than 50% of the total. If there is no winner, then the candidate with the fewest votes drops off the list. The votes for that person are then transferred to the second choices for all those voters. This process is repeated until one of the candidates gets over 50%. At first glance, this seems like a reasonable thing to do. If your favourite candidate doesn’t win, then you can transfer your vote to your second favourite. However, one of the basic questions that needs to be asked is, is giving someone their second or third choice as good for them as using their first choice? My sense is no, giving me my second or third choice is not the same as having my first choice acknowledged. The second problem that happens with alternate vote is that the current array of large political parties are often broadly lumped into two categories, right and left. While there is only one major right wing party, many believe that there are three or more left wing parties. With alternative vote, many left leaning voters will list the other left parties as their alternates, while right leaning voters may not have an attractive alternative. The left votes outnumbered the right votes by almost 2 to 1 in the last election, meaning that the AV system will systematically bias towards the largest left leaning party, the Liberals. Eric Grenier (CBC, 2014) from threehundredeight.com tested this hypothesis by using second choice polling data coupled with the vote counts. He found that the Liberals would have increased their projected seat count by an additional 28 seats, which would have reduced the proportionality of the result. I have duplicated this simulation and found a similiar result. In ridings where the first round does not produce a majority winner, then the process of shifting to alternates generated a total of 226 seats for the Liberals versus the 184 seats which they won in 2015. Based on popular vote, the ideal number of seats for the Liberals in 2015 would have been 133. This is a significant difference. This example demonstrates that the disproportionate representation is much worse with Alternate Vote, increasing the democratic deficit from 50.6 seats to 92.6 seats, almost a third of the seats in the House of Commons. Another challenge with the alternate vote system is that it will be necessary to enter all of the voting data into a computer in order to do the calculations. If the first choice comes out on top, then the result can be known right away, but if not, the final tally may take some time to produce, since the sequence of vote transfers can cause a flip between second, third or fourth parties. This will slow down the reporting process, and will make verification more difficult. 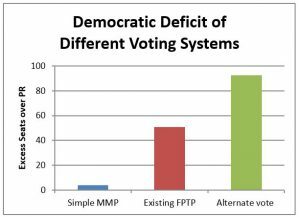 Many people believe that alternate vote is a proportional system. It is not. It is the opposite of a proportional system. It may make people feel better about their vote, because they at least contributed to the success of their second, third or fourth choice, but this feeling is short lived when the realization hits that your first choice has been disenfranchised once again. Simple MMP, on the other hand, reduced the 2015 democratic deficit to 4.1 seats. This system is clearly superior in producing results which reflect the intentions of the voters.